Affiliate links from our sponsors are used in the shopping links and sources in this post. 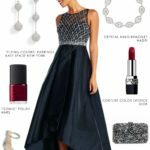 Silver or gray is a classic color for instant elegance, making it a favorite for Mothers-of-the-Bride, and and as long as the grey isn’t too pale, well-heeled wedding guests. 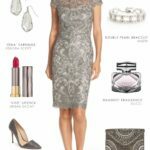 This gray lace sheath dress is a tailored style with exquisite lace detail that accents the clean and flattering silhouette of this dress – it’s a classic look! 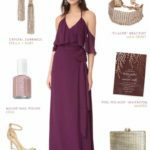 To let the detail in the lace stand out, I’ve chosen understated accessories in similar neutral metallic tones – with a pearl bracelet and mother of pearl earrings, along with subtle metallic details in the clutch and pumps. 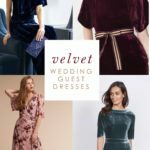 My own fall wedding guest dress hunt has has me eyeing a lace cocktail dress like this, and as far as I can tell on my screen, these deep ash gray tones are a lovely tone for fall! 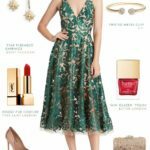 I may try this dress myself for a wedding I’m attending in late September. 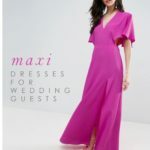 If you’re seeking more mother of the bride dresses in this length and in a neutral grey shade like this, I’ve selected a few more below, and I’m working behind the scenes on restocking some of our shop by color options! 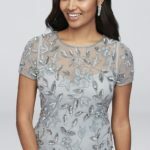 You also might love this post with a silver lace gown, this gray sequin style or this shop page for more silver and gray mother of the bride or groom ideas. 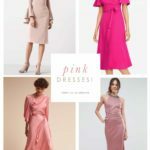 Also check out these neutral mother of the bride dress picks! Creating a Custom Wedding Perfume!